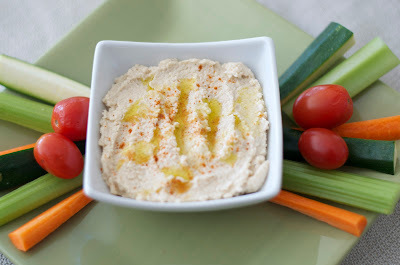 Oh hummus how I love thee so, but with chickpeas you are a no. That is, at least, until now. I figured that if I am using cauliflower for rice, pizza crust and mashed potatoes, that it might as well be a replacement for chickpeas too. In a sauce pan, put in the cauliflower and garlic and fill with water so it is half way full. Heat over medium high until it boils, then reduce heat slightly and cook until the cauliflower is tender, about 10-15 minutes. Remove cauliflower and garlic and place in food processor. Save liquid for later in the recipe. Pulse to break down the cauliflower and garlic. Add the tahini, lemon juice, olive oil and cumin. Pulse again, stopping every few times to push down sides. Add 2 tbsp. of the cooking liquid, and process until the mixture is smooth. Add more of the cooking liquid if needed. Salt and pepper to taste. Drizzle with a touch of olive oil and sprinkle with paprika to serve.